This great electric scooter for commuters is a creation by Ninebot by Segway. The company has created two electric scooters the ES1 and ES2 models. The two scooters look almost the same but the ES2 has some added features and is more powerful than ES1. Both of the electric scooters have an additional battery that you bolt on to increase the distance that the scooter can run on a full charge. It allows you to travel a whopping distance without requiring to recharge the scooter. The ES2 is a fantastic electric scooter that has amazing specifications and runs for an outstanding distance supported by an improved battery pack. This scooter is one of the best options when it comes to green transportation for commuters that have to travel a long distance. I honestly don’t think you’re going to find anything better out there when it comes to environmentally friendly transportation. The Ninebot Segway ES2 electric scooter features a lot of features that make green transportation no longer something to be imagined but something that can be an everyday reality. The scooter is the answer to easy daily commutes to and from work or school. In comparison to the other electric scooters in the market, the ES2 speed is quite above the average. The scooter can reach 15.5 miles per hour. You will be able to comfortably get around almost anywhere with that speed. The scooter has very good acceleration in comparison to the other electric scooters in the market. It boasts with a 300W power hub motor while most of the other scooters in the market come with 250W hub motor. The scooter’s peak power is 800W while the ES1 has a peak power of 700W. 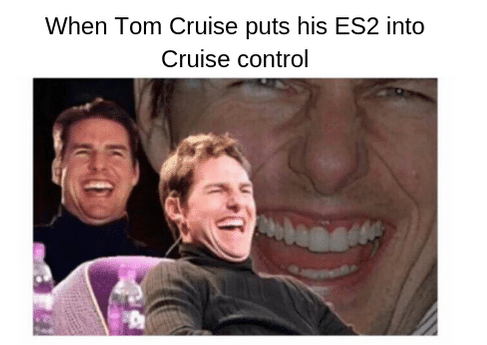 Bear in mind that you will experience the full acceleration of the ES2 when it is in sports mode. The ES2 has three riding modes. First you have the speed limit mode. You can set your scooter’s speed using the Ninebot smartphone app which is available for both Android and iOS. The speed limit mode comes in handy for instance when you are on a crowded path or when you have to use a car road or when you are just not so experienced yet. You just have to set a lower speed limit and you’ll feel much safer. The second speed mode is the standard speed mode which offers you a maximum speed of 12 mph and a moderate acceleration. I’d recommend this for everyday cruising. And third and most exciting when it comes to riding experience is the sports mode. With this mode you can reach the maximum speed of 15.5 mph and you’ll be entertained by the maximum acceleration. Just bear in mind that when using this mode the battery will also wear out faster. Who the Segway ES2 for? The minimum age that is recommended by the manufacturer is 14 years. The Segway ES2 is quite fast compared most of the other scooters on the market, therefore it is not the best option for the younger and less experienced riders. 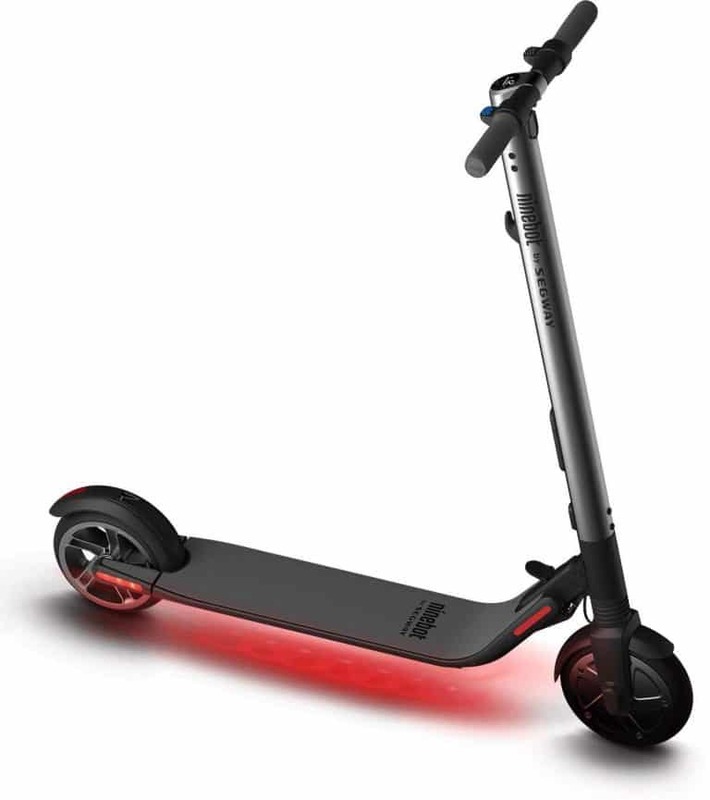 The scooter is best suited for teenagers who are able to calculate the speed of other road users and are also able to make good decisions regarding whether to cross, whether to continue moving etc. They should really feel comfortable when it comes to planning the next step they take as they navigate through the streets. The maximum weight that the electric scooter can handle is 220 pounds. The scooter has been tested by both lightweight and heavyweight users and the heavyweight users were also satisfied with the scooter. The scooter was still able to reach the maximum speed and its rate of acceleration did not slow down. The scooter has been built with safety in mind when it comes to staying on the road. It comes with antislip rubber that will make you feel safe when riding even if your shoes are wet. When it comes to the breaking system, it features a front electric brake and a manual rear brake. The easy acceleration and breaking systems allows the scooter to be well suited for the different environments and situations that the rider might come across. The ES2 is very well suited for a commuter who resides in the city. The scooter has small handlebars that make it easy to maneuver between people and cars while in traffic. I would not recommend to use the scooter in areas with steep climbs as the ES2 handles well only a climbing angle of up to ten degrees. If you opt for the upgraded battery version then you are able to climb an angle of 15 degrees. The ES2 is not by any means built for going off road. Ninebot by Segway has other scooters that are able to go off-road way more comfortably, but unfortunately they are not electric models. The ES2 is best suited for use on smooth roads e.g. pavements, streets, and pathways. It doesn’t handle well on wet or rocky surfaces. This electric scooter can be easily folded. You need to step on the small pedal located at the front of your foot surface and the scooter will fold and lock into the mudguard found at the back. The scooter becomes very compact when folded. It can also be wheeled like a suitcase making it easy to transport in the event the charge runs out and the scooter is no longer able to run. The fact that it can be folded means that you can be able to store it in your vehicle trunk or boot. You can even store it in under your bed or under the table in your office. The fact that it does not require a lot of room to store it is a great advantage also if you are one of those people that needs to use public transportation along the way to your office. The ES2 comes with an additional feature which is that when riding you have the option of folding the release pedal upwards to protect you from stepping on the pedal by mistake which could otherwise cause you to halt abruptly and thus crash. The ES2 takes a relatively short time to fully charge. The battery only needs three and a half hours to get to a hundred percent. The charging time is basically unmatched as there are very few other electric scooters that can charge as fast as the Segway ES2. If you decide to get the ES2 model with the upgraded battery version then it will take you double the time to charge which is seven hours, but you will be able to travel farther without requiring to charge the scooter. The manufacturer Ninebot by Segway ensures that they implement safety control on all the products including the ES2. The batteries feature short circuit protection, overcharge protection, overcurrent protectionnd overheating protection. The ES2 uses lithium-ion batteries which can last up to one thousand charge cycles. This will usually be up to three years when used regularly. The ES2 can travel up to 15.5 miles when the user is riding on close to perfect conditions. With the upgraded battery version of the ES2, the scooter can go up to twenty-eight miles which is pretty impressive for an electric scooter. This means that this scooter is well suited for long distance daily commutes. If your school is quite some distance from home then this electric scooter would be a great means of transport given how far it can travel without requiring to be charged. You can travel to and from school comfortably with no hassle of recharging. This electric scooter is made of hard aluminum alloy which makes the scooter quite lightweight. The scooter weighs 25 pounds. It also features some parts that are made of plastic which include rear foot brake, control pedals, and wheel covers. The ES2 electric scooter does have cruise control as well. This is a very important feature for people that live in the busy areas and have to use the scooter to commute daily. You will really enjoy this feature when you have to travel long distances (and which the scooter is perfect for thanks to its long range) as you don’t have to hold the acceleration pedal down all the road. The ES2 has a front and back shock absorption springs that are placed just above the wheels. The suspension definitely absorbs some of the small bumps on the road as well as some pavement inequalities that may be on your way, but as mentioned previously you should not go to real off road conditions with this scooter. You could categorize this electric scooter as the ‘smart one’. You can connect your scooter to your smartphone using the Ninebot app or via Bluetooth. As I already mentioned before, the app can be used on both iOS and Android devices. The app features a lot of features that make this scooter stand out from the rest. You can in a glimpse view your mileage, speed, battery status and riding history. You are also able to control the speed limit for the various speed modes that the scooter has. You can set up cruise control and you can also opt for the regenerative battery recharge level. The Ninebot app has yet another amazing feature, it allows you to lock your scooter. The scooter wheels are put on the brake when someone tries to move the scooter and you get a notification on your phone that this is happening. This is a great safety feature as you may be able to stop the theft of your scooter when this should ever happen. Of course, it is not guaranteed as you never know what tricks the thieves use nowadays, but it is good that the manufacturer has thought about this extra feature. The ES2 can withstand water splashes coming from all directions as it has a waterproof rating of IP54. It doesn’t mean however, that you should leave your scooter in the rain. 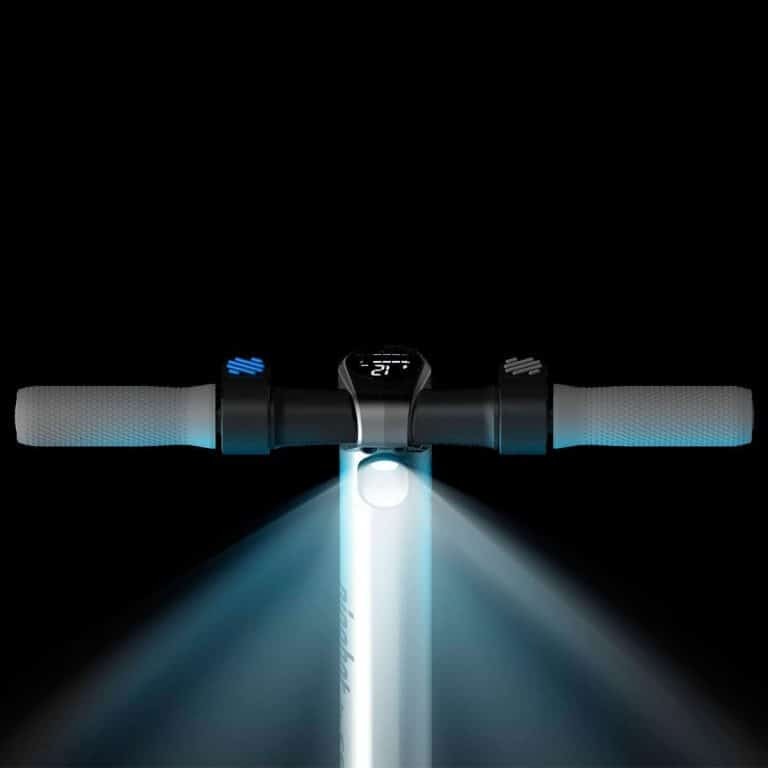 The Segway ES2 has a LED lights underneath the scooter in the front and in the back. The light helps to illuminate the ground using different colors which gives it a cool look especially in the late hours. In addition, the lights also make the scooter more visible for cars and other riders and hence increase the rider’s safety. The ES2 comes in two colors – black and silver. This makes the scooter quite universal as it fits well all genders and ages of riders. 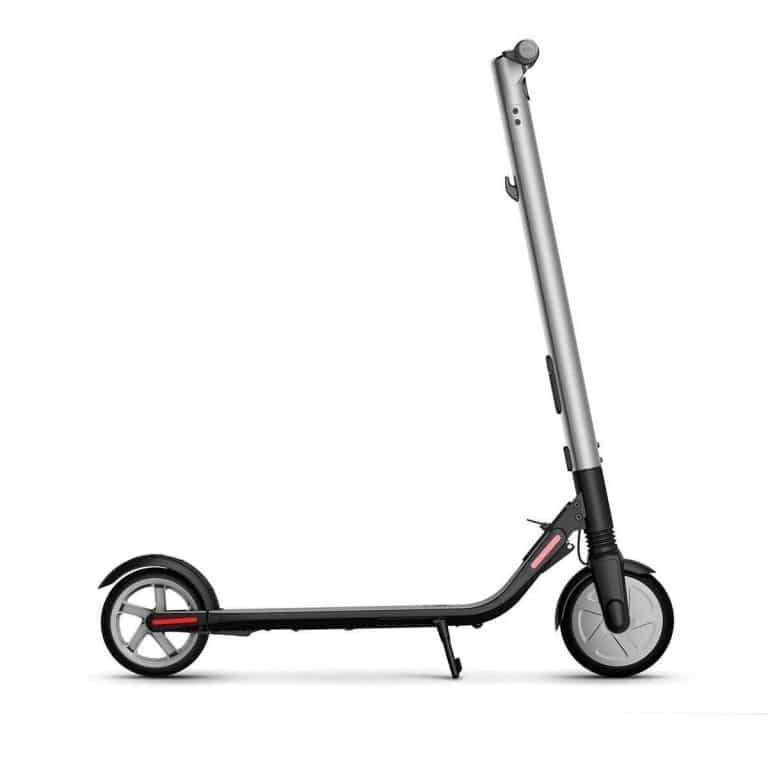 The scooter is made of aluminum alloy which gives it a very firm feel. The connections and joints on this scooter are very sturdy and are built to last. When it comes to the tires, they are made of hard rubber and they are not filled with air so they cannot go flat. The Ninebot by Segway will repair your scooter should it need any repairs within the warranty period. If your scooter is damaged or broken then you can ship the scooter back to them and they will repair the scooter at no added cost apart from shipping. The warranty period is 1 year from the date of purchase.